Choosing the proper support or foundation for your artwork is important. Different types of art call for different techniques and materials to be used. A poster or print can be dry mounted by using a pre-coated adhesive foam board or dry mount tissue and foam board. Using heat and/or pressure, the art is adhered to the board. This process keeps the artwork flat. 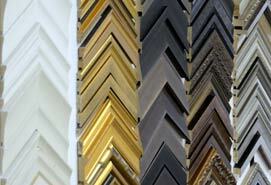 There are a number of ways to mount higher value artwork or photographs. These methods require the use of archival or rag foam boards and archival mounting materials. It is very important to use the appropriate techniques for each type of artwork for conservation purposes. Textiles, canvas and object mounting require special materials and mounting methods for proper construction and support. The mat serves two roles. First, it provides a design element by using color, texture, size and depth. We suggest and use either 100% cotton rag or Archival mats. Paper mats are available but are not suggested due to the impurities that could damage the artwork. Color: Whether choosing a neutral tone or a color, we look at what will complement the piece and overall design. Texture: Add texture or enhance the existing texture by using silks, linens, leather and more. 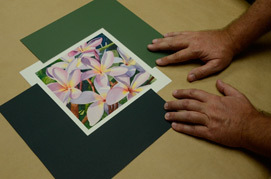 Size: A wide or more visible mat creates more “breathing space” or “head room” for the artwork. Depth: Depth is created by using multiple mats and/or space between the mats. This effect helps direct the viewer into the artwork. The second function of the mat is to create air space between the artwork and the glass. 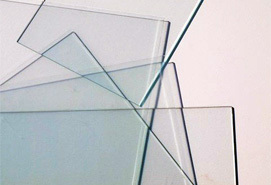 If a mat were not used, the glass would be directly on top of the artwork. This could cause problems when condensation forms in humid environments. The glass could become stuck to the artwork leaving no way to separate them without damage. Spacers can be used in place of a mat to create the same air space. The frame is technically what holds the whole thing together. It also provides an important visual part of the project. There are thousands of styles, shapes, textures, colors and sizes available. Most often a single frame is adequate but you can stack frames to create a unique design. Premium Clear: This is standard clear picture framing glazing. This type does not offer any UV protection or anti-reflection properties. Non-Glare/Anti-Reflection: These are two types of glazing that will reduce the glare or reflection due to the amount of light that exists in the room where the artwork will be viewed. UV-Filtering: This glazing has a UV protective coating to help reduce damage and fading caused by sunlight or even standard home lighting like florescent or incandescent. Museum Quality: Museum glazing is a combination of the best qualities. It offers the highest UV protection with anti-reflection properties. This product is generally user on high value pieces or for the person that wants an ultra-clear (almost invisible) view of the artwork. It is ideal for shadow box or deep-mat framing projects.